It's been confirmed by Microsoft that Windows 10 will work at a lower resolution than both Windows 8 and 8.1 when it is released this summer. At the Windows Hardware Engineering Conference (WinHEC) in China, the company confirmed that Windows 10 desktop PCs will only need a minimum resolution of 800 x 600 pixels in order to run the new OS, according to PC World. Windows 8.1, meanwhile, required a minimum screen resolution of at least 1,024 x 768 to access the Windows Store to run applications in the Modern user interface. Things are even more stringent for Windows 8 users as "snap apps" require a minimum resolution of at least 1,366 x 768. The other minimum requirements mirror that of the past two versions of the OS. This means that Windows 10 requires memory of at least 2GB for 64-bit or 1GB for 32-bit, minimum storage of 20GB for 64-bit or 16GB for 32-bit and at least DirectX 9 installed. 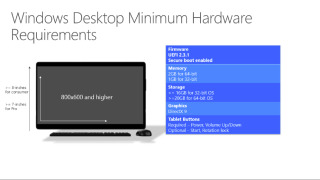 Another difference is the screen sizes that the Windows 10 Professional and consumer versions can run on. The Professional edition requires just a 7-inch screen, whereas the consumer iteration needs an 8-inch screen. However, both of these will be more relevant for tablet manufacturers than PC makers. Windows 10 also ships with the UEFI 2.3.1 firmware interface and each copy of the OS will have a Trusted Platform Module built-in. Alongside this Microsoft also revealed the requirements for Windows 10 smartphones will be released at the same time as the fully featured desktop version and include a ream of different options for manufacturers of mobile devices. Earlier this week at the same WinHEC summit, Microsoft EVP of operating systems Terry Myerson said that Windows 10 will be landing this summer without a specific date. The new OS will be a free upgrade for Windows 7, 8 and 8.1 users. Even those who own pirated versions of Windows will be able to take advantage of that offer. The latest version of the Windows 10 Technical Preview (Build 10041) was released to the "fast" ring yesterday with a number of tweaks including start menu transparency, enhancements to the Virtual Desktop experience, new languages in Cortana and a lot more besides. Anyone can download the Windows 10 Technical Preview by signing up as a Windows Insider right now to try it out before its commercial release lands in the summer.